Climate changes; extreme rainfall events; flood risk. The occurrence of exceptionally heavy rainfall events and associated flash floods in many areas during recent years motivate us to study long-term changes in extreme rainfall over India. 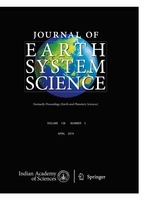 The analysis of the frequency of rainy days, rain days and heavy rainfall days as well as one-day extreme rainfall and return period has been carried out in this study to observe the impact of climate change on extreme rainfall events and flood risk in India. The frequency of heavy rainfall events are decreasing in major parts of central and north India while they are increasing in peninsular, east and north east India. The study tries to bring out some of the interesting findings which are very useful for hydrological planning and disaster managements. Extreme rainfall and flood risk are increasing significantly in the country except some parts of central India. India Meteorological Department, Shivajinagar, Pune 411 005, India.